Job-hunting is one of the toughest phases in life and if you want to win your dream job, you must begin with your resume. 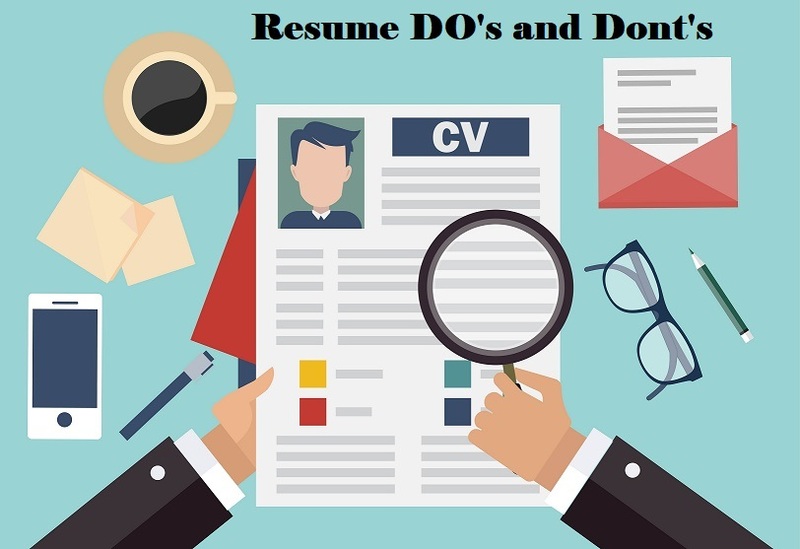 To have an effective job-search, tweak your professional resume after comprehending the important dos and don’ts of resume writing. From avoiding the usage of erratic fonts to hazy formats and haphazard organization, we have listed five pivotal dos and don’ts of professional resume writing. If you’re wondering whether your resume will win you the job, all you need to do is compare it with our advanced Rules of Resume Writing and rate the resume on your own. A definite way to captivate your hiring manager’s attention is by using quantifiers when writing resume experience. After dividing the experiences into bulleted points, use facts, figures and technical terms to describe your relevant experience towards the work. As most recruiters use the Applicant Tracking System today, you must format your resume (not PDF) for the ATS using keyword optimization and relevant skills sought by the employer. With ATS, recruiters can now scan multiple CVs and remove the disorganized and irrelevant resumes in a jiffy. ATS computers scan resumes for industrial and technical keywords to chronologically rate them, in order to screen the best candidates. Hence, when preparing and writing your resume, cross-check if ATS can scan it. Personal achievements that highlight your soft skills relevant to the job are crucial to writing a good resume. You must list your personal achievements such as being a dedicated Marathoner, Deep-Sea Diver or Expert at Computer Skills to emphasize your personal brand. Moreover, relevant hobbies and interests also establish your personality and superior expertise in communication and people skills. Write your resume as an answer to the questions or responsibilities sought by the employer. A cliche resume phrases jargon that does not captivate or glue the hiring manager. An ideal resume must cite your specific experiences, skills and technical proficiencies best used by the recruiter. To do so, include your exceptional skills and experience of profiting the employer in past jobs. It is common to misspell a word or miss a preposition in when listing attributes in a resume. However, in professional resume writing, you must not have errors. Moreover, the second pair of eyes is always excellent to spot errors, often neglected by the writer’s brain. Asking a friend or family to read the resume after you’re done with the final draft will avoid your resume getting rejected at the hiring desk. Today, you can also find editors online to correct your resume at fair rates! To make a lasting first impression on your hiring manager, you must proofread your resume tenfold times before submission! The most important guidelines necessary to craft a flawless resume are things to avoid putting on a resume. To do so, you must assess multiple resume samples to comprehend the formal style, tone, and format of resume writing. Your experience of serving in the controversial political alliances to LGBT activism, controversial job history can often become a threat to the employer’s faith in you. As you never know who will assess your resume at the hiring desk, it is good to be diplomatic and avoid the controversial work experience from the resume. One of the cardinal rules for writing a Perfect Resume is by listing technical skills and achievements relevant to the job. Using specific job-related keywords will impress the hiring committee. If you’re a fresher or graduate, lack of relevant experience is another thing to avoid on a resume. Hobbies and interests that emphasize irrelevant traits can be misleading to the hiring process and considered as clutter. Instead of adding irrelevant experiences on your resume, it is wise to condense the section with relevant points. Do not make Filler statements without the facts or backgroundIt is important to prove to the hiring manager that you’re a perfect candidate for the job. To do so, your resume must furnish the skills and responsibilities sought by the employer. In order to prove your professional expertise at work, refer to past jobs with a brief explanation of your duties that establishes you as the best pick for the job offered. Don’t Exceed Two PagesA professional resume must be brief and relevant to help the manager cite your exceptional skills in an unending pile of resumes. Keeping a resume concise, lucid and succinct requires condensing unimportant jobs and eliminating don’ts in a scannable resume. According to Google Senior VP, one-page resumes is the norm for candidates with 10-years of industrial experience. Moreover, candidates are advised to avoid lengthy or elaborate paragraphs on the resume. Don’t Hide Gaps in the RésuméIt is mandatory, to be honest in your professional resume. Do not lie about your resume experience to hide the gaps in your resume. A clever idea is to avoid mentioning time scale to your job experience, to hide the obvious gaps. Moreover, the work you did during your unemployment would also fit as the relevant skills that you acquired. Mention the same skills by connecting it to the job instead of leaving gaps in the resume skills section. There are many ways to establish your superlative skills and technical proficiencies in a resume to captivate the hiring manager. Your aim is to present an up-to-date resume that outwits the other candidates and confidently secures the job for you. Writing an effective resume does take time, effort and diverse assessment of best resume samples in your field of work and also selecting the best resume template to craft your resume. However, with the aforementioned resume Dos and Don’ts, your profile will be enhanced and taken as a perfect fit for the job, by the manager.